"The music in Ireland is developing, and the people are expressing themselves. It's very different to the music of the Irish people who moved away twenty years ago. Those who emigrated play music that's very different to the way young kids in Ireland are playing music now..."
There's no shortage of traditional Irish quartets, quintets and oddtets that play in pubs, festivals and concert halls around the world. But Lunasa are no ordinary quintet joined together to play some tunes and have a laugh. 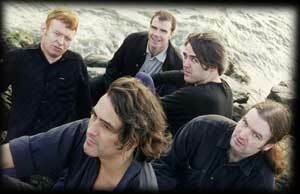 In four short years, Lunasa have become one of the most successful traditional Irish bands to ever hit U.S. shores. 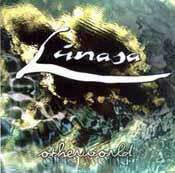 Otherworld, Lunasa's second album, is a remarkable acheivement. Traditional without being narrow-minded and innovative without being avant-garde, you don't so much listen to the songs as you absorb them. In many respects, Lunasa's music is eerily reminiscent of the Celtic traditions of knotting. Upon a first look, one sees the overall pattern. Then upon closer examinations a pattern slowly reveals itself. On their opening track, "Goodbye Miss Goodavich/Rosie's Reel," the delicate interplay between bass, guitar, flutes and whistle is matched only by the complex melodic and rhythmic shifts as each instrument flips from spotlight to support without a hitch. Try to untangle this knot and you'll go crazy; best just to listen and appreciate it! When Lunasa wrapped up their latest U.S. tour in San Francisco in early March, they spared a few moments to chat about the band, the music and the new album. Fiddler and whistler Sean Smyth was the main spokesman, and summed his feelings about Lunasa succinctly: "It's the type of band I've always wanted to be in. It's the type of music I've always grown up with, the pipes, the flutes and fiddle, the music I've loved. And with Donogh and Trevor doing what they do, it's absolutely amazing." About the success of Otherworld, he added: "It's always a thrill to have created something that's been so well-received." Well-received, certainly, but also well earned. Lunasa maintain a grueling tour schedule, which helps build their fan-base. The band traveled throughout the U.S. both before and after the release of Otherworld in 1999. Whereas most groups will land 20 dates a year in North America, Lunasa regularly pull down 80-90. It's an old-fashioned style, but it works. So what makes Lunasa tick? Sean credits the bandmates' varying backgrounds with driving the success of Lunasa. "Thirty years ago [a band would] be very local in Ireland," he muses, "but we're from all over: Cillian lives in New York, I'm from Mayo and Donogh & Kevin live in Dublin." But don't discount their pedigree either. Sean himself is an All-Ireland champion on fiddle and whistle. Donogh notched three years with the Sharon Shannon Band. Kevin Crawford is a former member of Moving Cloud. And Trevor? "Trevor coming from a rock band [he recorded two albums with The Waterboys] has been a great help to us. He makes us look at the music from a different perspective. He actually writes what he thinks is cool... and that's what people have picked up on." The depth and complexity of Lunasa's rhythm arrangements do stand out, providing a solid foundation over which the melodic elements can flow. On "The Millers of Drohan," a beautiful slow air, Trevor abandons his upright bass for a cello. "I'm not a very good cellist," he readily admits, but he enjoyed the challenge of composing the ominous arrangements that flow under the tune, and establish the somber tone. So it's a surprise when the flutes enter, lifting the song with an airy melody like shafts of sunlight on a rainy afternoon. This juxtaposition of light and dark is the musical equivalent of a Rembrandt painting, where the two elements become inseparable in the overall effect. Other tunes with this dichotomy are "Autumn Child/Heaton Chapel," which begins as a flowing reel, but finishes as a relentless march led by the uillein pipes and fuelled by the furious bowing of the bass. "This band is a sum of its parts," Sean quips. Some critics apply the word "jazzy" to Lunasa's music, but Sean disagrees with such classification. "We're always trying to blend the new and the old, and though it makes some people uncomfortable we're very very true to the way the old melodies are, when we play them. We don't do any jazz/blues revampings or anything like that, though we do blend in some new melodies and harmonies, and of course added the rhythm section." Sean likens the musical path Lunasa travels as one parallel with their homeland. "There's very much an economic boom in Ireland," he says, "and the music in Ireland is developing, and the people are expressing themselves. It's very different to the music of the Irish people who moved away twenty years ago. Those who emigrated play music that's very different to the way young kids in Ireland are playing music now, because [the emigrants] want to play the music the way their fathers played it. The music is MORE traditional. If you really want to hear traditional music go to a sesuin in Chicago or New York. It's scary. Unreal. It's music I would have listened to as a kid in ceili bands in my house. The tunes are all the same, and the tune that comes after a tune is the same tune that's come after it for years. And [this sense of repetition] is important to them; it's their connection to the culture of Ireland. Of course our connection is different." Though not fixated on technique, they're sticklers for thoughtful arrangement. "We're always conscious, whether on a recording or playing live, of the textures of the piece." Lunasa delight in the unexpected not for its own sake, but to unveil the soft belly of the tune. Tempo changes, brutally percussive blasts of flute and fiddle and the snaky pulse of the bass and guitar indicate that Lunasa are building upon a tradition, not blindly adhering to one. On stage, Lunasa's set-up mirrors their commitment to honoring both the melody and rhythm of the music. Trevor, tall and lanky, provides the bottom end on an upright bass, stands stage right during shows. Donogh (whose long black locks and percussive strumming technique make him the "rock star" of the band) anchors the left side. Betwwen these rhythmic bookends are the melody-makers. From stage left to right: Sean Smyth (fiddle and whistles), Cillian Vallely (uillean pipes and whistles) and Kevin Crawford (flutes and whistles). Such an arrangement, set in a half-circle, allows the greatest level of communication both amongst themselves, and the audience. Sean comments: "The communication between the band members is the most important element. It's all about the energy. And playing live, it's about connecting with the audience." And in the airplane-hangar-like venue of S.F. 's Fort Mason Pavilion, Lunasa had no difficulties in communicating. Enthusiastic listeners kicked over chairs, swung each other in circles and generally whooped it up with square, set and step dances galore. The pie lady even joined her young son in an impromptu jig. Their eleven-song set (plus a two-song encore) was equal parts material from Otherworld, their eponymous debut, and their upcoming release The Merry Sisters of Fate. 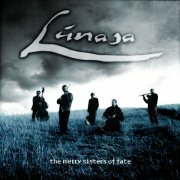 From those songs, its clear Lunasa are exploring some new ground. Breton and Galician tunes showed up on many songs, including a medley involving a Mayo Clan march, a Breton an dro "Snow on the Mountains" and a reel entitled "Maze on Mt. Cisco." The middle tune had Cillian gamely reproducing a melody intended for a bombarde on his pipes. published by Green Linnet, US. Head shots courtesy of the Lunasa web site.